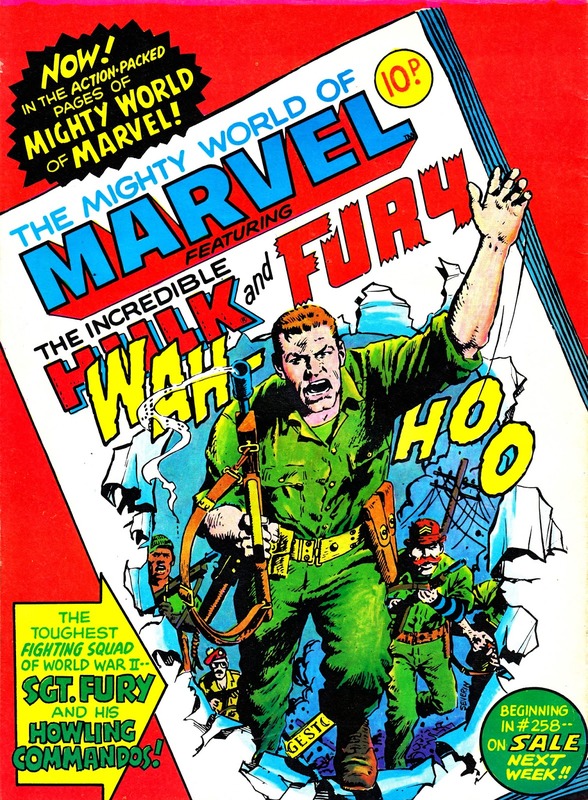 I've covered MARVEL UK's short-lived FURY, a half-hearted (nice covers!) attempt from the Neil Tennant era to cash-in on the success of WARLORD and BATTLE from Marvel's rivals, in a bygone post but only recently uncovered this full-page merger announcement from the back cover of THE MIGHTY WORLD OF MARVEL issue 257 (cover-dated 31 August 1977). Here's my original FURY post. Surely the worst of Marvel UK's never-ending mergers, Fury should have been dropped altogether. Cover dated 31 August 1977 which was my very first day in comprehensive school, they couldn't even let us have the whole of August. Wow! That's harsh! That's the sort of early return that would create great frustration as the kids summer TV would run at least another week and - you know - you don't want to miss any minute of (in those days) such a rationed rarity. I remember when Roland Rat finally revealed Error the Hamster ("Run VT Errol!") - after much build-up - the day I had to go back to school in those pre-VHS days. Humpf!